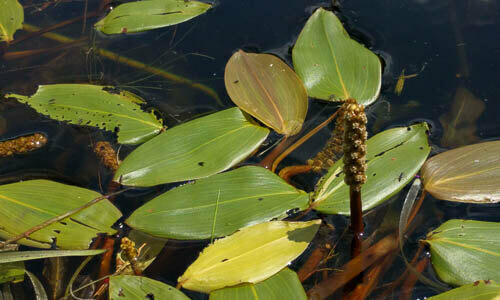 Eelgrass develops seed-bearing shoots in early summer. 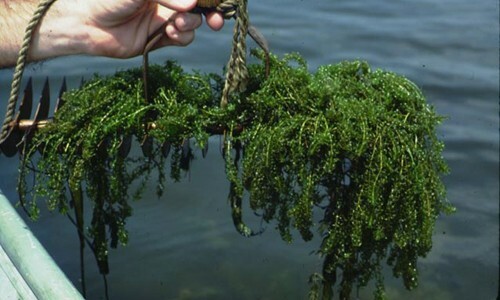 Grows in salty tidal waters of medium to high salinity. Usually found in shallow, sandy areas and occasionally found in deep, muddy areas. Ranges from the Honga River on Maryland’s Eastern Shore south to the mouth of the Chesapeake Bay. Eelgrass and widgeon grass are the dominant bay grass species in the Virginia portion of the Bay. Eelgrass is a bay grass with long, ribbon-like leaves. It grows in the saltier waters of the middle and lower Chesapeake Bay. Eelgrass is made up of long, ribbon-like leaves that can grow to 4 feet long, but vary in size depending on the plant’s location. A wide, tube-shaped sheath is at the base of each leaf. Eelgrass has thick, creeping rhizomes with many roots and nodes. Migratory waterfowl such as brants, redheads, widgeons, black ducks and Canada geese feed on eelgrass, as do green turtles. Although they do not feed on eelgrass, cownose rays destroy eelgrass beds in many areas as they root through bottom sediments for their prey. Asexual reproduction takes place when the rhizome grows and winter buds called turions form. Sexual reproduction takes place in early summer, when female flowers are fertilized by drifting pollen and develop into seed-bearing shoots. The shoots eventually break off, float to the surface and release their seeds. 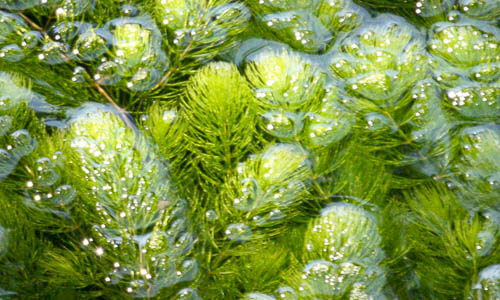 Part of its scientific name, Zostera, means “belt” in Greek. This refers to the plant's ribbon-like appearance. Eelgrass provides important foraging areas and habitat for blue crabs. Juveniles and molting adults hide from predators among eelgrass beds. It can be confused with wild celery. You can distinguish eelgrass by its leaves, which are narrower than wild celery’s. Additionally, eelgrass only grows in the saltier waters of the middle to lower Bay, while wild celery grows mostly in fresh water.